ProSmoke represents top shelf quality and cutting edge technology when it comes to electronic cigarettes. Today, many brands have opted for a 2-piece design battery and cartridge unit holding a disposable atomizer. Having a seperate atomizer is now mostly only found in PVs or E-Go smokeless cigarettes. In ProSmoke’s case, they saw the value in opting to stick with a separate 3rd piece atomizer for a higher grade of vaping hardware. The long lasting atomizer helps ProSmoke e-cigarettes perform like bigger devices do but offered at the same valued cost as many other top e-cigarette brands. ProSmoke is also committed to being green and favors VG e-liquids to have the safest product possible, but that may deter those who like the throat hit of PG. 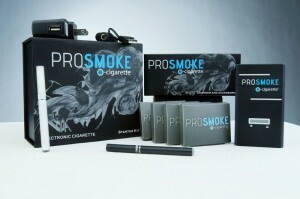 Check out our full review of ProSmoke Electronic Cigarettes to learn more. 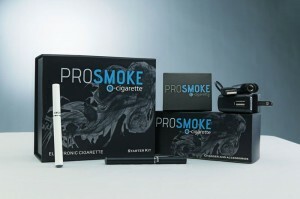 What follows are the three different types of starter kits that ProSmoke offers customers. But for those who might be looking for disposable models, ProSmoke Disposables are also offered, but don’t expect the same performance from the single-piece unit. 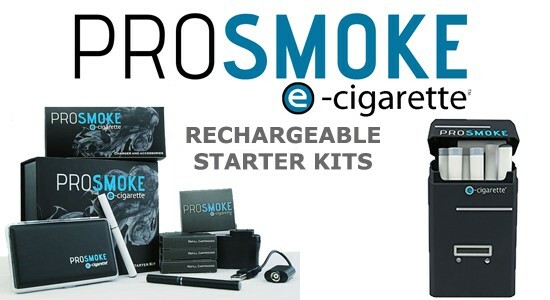 The basic starter kit has everything needed to get vaping with ProSmoke e-cigarettes. The lithium batteries are designed to last a long time and the fact that there are two of them gives ProSmoke extra points, where many other standard starting kits as they usually only include one. Not only for that reason, but because you also get your choice of nicotine volume and flavors, with no limitations. Although many entry level starter kits cost less, the latest revised price is very fair. The Super Starter Kit is step up in hardware by featuring a portable carrying case that is slim enough to easily fit in your pocket or bag. With this kit, you get to try out 4 different flavors with the 4 cartridge packs included and offers a good bang for your buck. The same two batteries and chargers are included. The Deluxe Starting Kit is the same as the Super kit but replaces the carrying case with a portable charging case, which means that the e-cigs can be recharged without having to plug in any devices. For a price difference of 10$, there’s a strong advantage in choosing the Deluxe Starter over the $99 ProSmoke Super Starter kit. The personal charging case can give 5-10 full battery charges on the go, and takes a full 8 hours to fully charge it’s big capacity battery. At the same time, allows you to carry an extra fully assembled e-cigarette and 4 cartridges or atomizers. 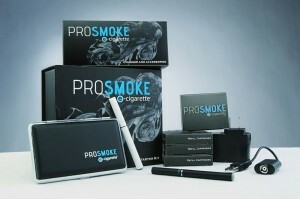 It’s ProSmoke’s best accessory and we think this kit is the best value overall. Overall, there is little doubt that ProSmoke will continue to appeal to many of those who appreciate the quality of product that it is being offered. ProSmoke’s 3-piece design does require more maintenance and is generally favored by vaping aficionados, but it’s a reasonable trade. The super long lasting batteries are top quality as well, and help make ProSmoke a solid investment.